This updated comprehensive guide helps people discover how God has uniquely created them. Engaging stories, inventories, self-tests, and other easy-to-use exercises make Discover Who You Are a one-ofa-kind tool. It will help those longing to find or deepen meaning in life, considering volunteer opportunities, contemplating career changes, or desiring to become more useful to God. The book, workbook, and leaderbs material provide all thatbs needed for a LifeKeys workshop. - Publisher Updated and revised, this workbook adds powerful learning tools to maximize your LifeKeys experience. - Publisher Jane A.G. Kise, EdD, is the coauthor or author of more than a dozen books, including Finding and Following God's Will and Find Your Fit. She and her family reside in Minneapolis, Minnesota.David Stark is the director of Changing Church and leads workshops and seminars throughout the United States. David holds an M.Div. He lives in Minnesota with his family.Sandra Krebs Hirsh is a management consultant worldwide, providing career, leadership,and organizational development consultation. One of her books on the Myers-Briggs Type Indicator inventory has sold over two million copies. 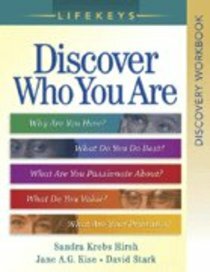 About "Discover Who You Are (Discovery Workbook) (Lifekeys Series)"
Updated and revised, this workbook adds powerful learning tools to maximize your LifeKeys experience. Jane A.G. Kise, EdD, is the coauthor or author of more than a dozen books, including Finding and Following God's Will and Find Your Fit. She and her family reside in Minneapolis, Minnesota.David Stark is the director of Changing Church and leads workshops and seminars throughout the United States. David holds an M.Div. He lives in Minnesota with his family.Sandra Krebs Hirsh is a management consultant worldwide, providing career, leadership,and organizational development consultation. One of her books on the Myers-Briggs Type Indicator inventory has sold over two million copies.